Last week I was offered the chance to do something which I very rarely (if ever?) do on this blog. I was offered a toy review. I was a little hesitant when I replied, because if I can be entirely honest with you I’m quite picky about toys. On my list of dislikes are toys that aren’t made well, or only hold Theo’s attention for 5 minutes, or (and I’m being really honest here) are just plain ugly to look at. 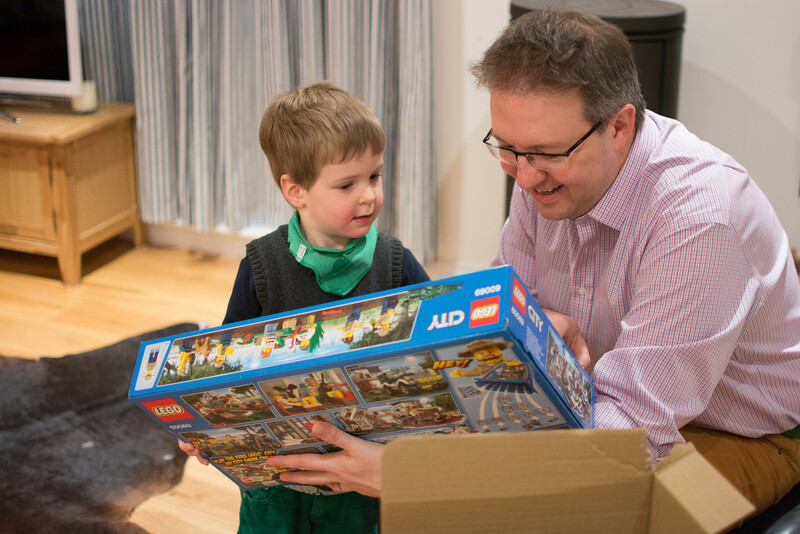 Jim has been champing at the bit to play with Lego since Theo was born, but I didn’t really realise quite how amazing it was till a year ago when I bought Jim the 1000 piece Lego VW Campervan for Christmas. It not only kept the grown up it was bought for occupied for several days, but had Theo entranced too. The two of them sat at the kitchen table for hours on end (I’m not exaggerating) sorting the blocks and pouring over the instruction booklets, whilst I got on with things completely uninterrupted. Since then more of the brilliant bricks have made their way into our lives and with every new kit, Theo gets a bit more involved and a bit quicker at assembling it. So when George at Asda offered us the chance to try a kit from their educational toy range, I’m not quite sure who in this family was the most excited. After quite a lot of deliberation, Theo and Jim decided on a Lego storage box along with the Swamp Police Station which comes with a swamp boat, RIB, 4×4, motorbike, 3 snakes, a dog and a crocodile! True to expectations construction began almost as soon as Jim was in the door on Friday night and went on for all of Saturday, if it hadn’t been for the fact I was required to take photos they probably wouldn’t have noticed if I’d gone out for the whole day. It still amazes me that a toy can hold the attention of a three year-old quite so completely and to watch him carefully and methodically work his way through the step by step instructions was quite impressive. But there’s trouble brewing! Theo is apparently getting so good now that Jim is being pushed out and worst still, there were moments when I saw him step in to correct Theo’s assembling and then realise a second or two later that no, it was him who was wrong. Oh the shame! This is great 🙂 he looks so happy to be playing with it, my little boy is still a little young for Lego but I’m looking forward to him being able to create things. Lego – best toy ever (until you step on it). We started with the bigger Duplo pieces. I bought the girls a huge set at Christmas when the girls were fairly small. That March we were visiting my Dad at the seniors complex and it kept them entertained in a tiny apartment. Good thing as the gaskets went on our van and it kept us there for a couple of extra days. I have buckets of the stuff and will never give it away. Even older people love it – we took my dad up in a helicopter for a ride on his 90th birthday – then I bought him a small Lego helicopter which I regularly would construct for him. I still have it. The other toy we all relished were the Playmobile sets – the victorian mansion is still set up in my basement. Lego is BY FAR our favourite toy in the house. Next to cars that is. What a cute video – love when he was playing in the box…always the way, isn’t it? What a fab video! We’re still deeply into Duplo at our house but Hubs is building up a collection of Lego play sets for when Bubs is old enough to help build them. He looks thrilled with it! Oh I love it! We’re still mostly in the Duplo phase (and it’s probably the most played with toy in the house) but some Lego is starting to creep in for Kitty. H on the other hand is a lifelong fan – the girls and I gave him the Star Wars Ewok Village for his last birthday and he spent many hours happily building with two small supervisors alongside! LEGO is the best! I love watching my son and husband putting their newest sets together! I always said I wouldn’t have Lego in the house. Then my son got his first set and he was to enthusiastic about it, we had to have more. It is brilliant!